► MAYOTTE: Air Austral, CCIM, Ylang Invest move to formally create Ewa Air. The Mayotte Chamber of Commerce and Industry (CCI Mayotte) along with Air Austral (UU) and the Yland Investment consortium officially signed an investment contract last week effectively breathing life into the new Dzaoudzi-based regional carrier, Ewa Airlines. ► MAYOTTE: New Indian Ocean regional carrier, Ewa, eyes Madagascar, Tanzania, Comoros and Mozambique flights from Q4. La Réunion-based carrier, Air Austral (UU), is set to partner the Mayotte Chamber of Commerce and Industry among other shareholders in setting up a new regional carrier to be based out of Dzaoudzi. ► THAILAND: Air Austral switches Chennai/Bangkok flights to night time ops from late March. Réunion-based carrier Air Austral (UU), from 31MAR13, is to adjust its operational schedule on its St. Denis de la Réunion – Chennai (Madras) – Bangkok service. Currently, the airline operates morning and night-time departure from St. Denis, 1 weekly each. This will be changed to a night-time departure only. ► SEYCHELLES: Air Austral adjusts La Réunion - Mahé from late March. La Réunion-based carrier Air Austral (UU) is, during the Northern Summer 2013 season, to adjust its operations on the St. Denis de la Reunion – Seychelles route. ► IRAQ: Air Austral's unwanted Boeing 777-200LR finds a home with Iraqi Airways. Respite has come to Réunion-based carrier Air Austral (UU) who, at last, have found a solution to the nagging problem of an unwanted Boeing 777-200LR (MSN 40993 | F-OLRB) that has been sitting idle in Seattle, awaiting delivery. Unable to pay for the aircraft, Air Austral have now been able to find a willing buyer in the form of the Iraqi Government who will then lease the aircraft out to Iraqi Airways (IA). ■ RÉUNION: Air Austral bounces back with a $7.35million profit for Q3. In a dramatic change of its fortunes since posting a Q1 loss of EUR27million earlier in the year, Réunion-based French carrier Air Austral (UU) yesterday announced a profit of USD7.35million (EUR5.78million) for Q3 of its 2012 Financial Year, an improvement of USD9.89million (EUR7.78million) on its loss of USD2.54million (EUR2.0million) for the same period last year. ► MADAGASCAR: Air Austral & Air Madagascar to codeshare from November. 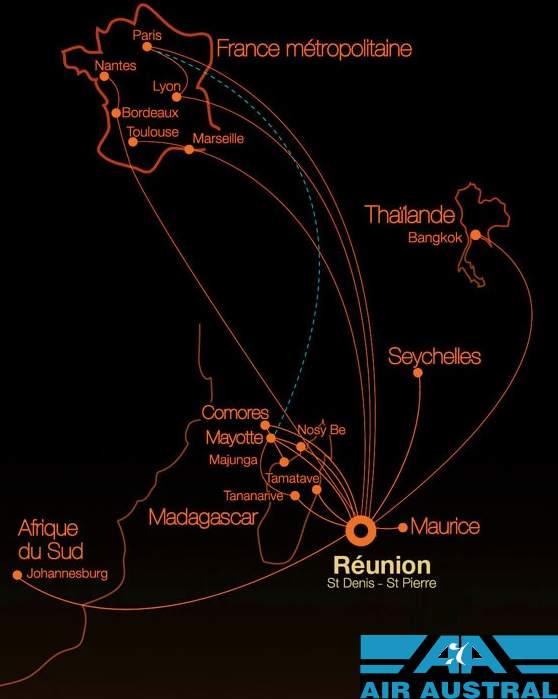 In the first developments following the announcement last week of an "alliance" of sorts between Air Mauritius (MK), Air Madagascar (MD) and Réunion-based Air Austral (UU), Air Austral and Air Madagascar are to enter into a twice weekly codeshare service on the Saint Denis, Réunion - Antananarivo, Madagascar route. ► MAURITIUS: Emirates to go 14x weekly as Air Mauritius, Air Austral & Air Madagascar band together to survive. Bucking the ongoing trend amongst European carriers of reducing their frequencies to the Indian Ocean island, Dubai based mega-carrier, Emirates (EK), has announced an increase in its weekly frequencies from 11x weekly to 12x weekly from 28 October 2012, with the route going 14x weekly from 28 November 2012. ► RÉUNION: Air Austral to continue French services until January 2013. Réunion based carrier Air Austral (UU) is to continue its services between Réunion and various French cities namely Marseilles, Toulouse, Lyon and Nantes into January of 2013, having previously announced their suspension for 28 October 2012. Its service to Bordeaux however (routed via Marseille) is to end on 28 October 2012. The route rationalizations come as part of Air Austral's efforts to return to profitability following a nasty 2011 financial year which ultimately forced the cancellation of the carrier's Australian and South Pacific operations, as well as the cancellation of two Airbus A380s it had ordered. ● IATA: Strong growth for Africa in 2011/2012 but lower profits; The winners & losers so far. The International Air Transport Association (IATA), which represents some 240 airlines worldwide and comprising 84% of total air traffic, has released its annual statistics for the year 2011/2012, with Africa showing very strong growth in terms of actual passengers carried, as well as freight tonnage hauled, in stark contrast to crisis ridden Europe, which has struggled some what.